City officials kicked off the second year of its “Pattaya White” anti-drug campaign with rallies at Pattaya schools 2 and 8. 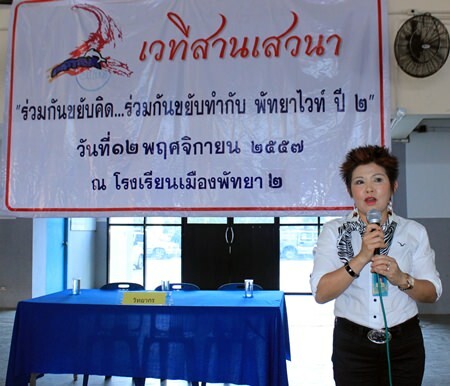 Public Health Department researcher Bubpa Songsakulchai lectured on the effects of drug use and methods to prevent it. The goals of the meetings were to boost public participation in brainstorming to find ways to effectively tackle drug problems and encourage youths, business operators and community members to stabilize the community and overcome the drug problem together. Public Health Department researcher Bubpa Songsakulchai gives a lecture on the effects of drug use and methods to prevent it. The same event also will be held at schools 7 and 11 this month. Jutamas Beauty School also gave free haircuts at the event. The goal of the “Pattaya White” project is to bring community members closer, strengthen families and encourage all residents to use their free time productively, learn the value of education and develop a balanced and sustainable community. Started amid political upheaval, the focus has now turned to quashing drug use among youths. This year’s slogan is “work hard, work fast and work creatively” and organizers have planned activities along that those themes.